Bandai Namco Games has just announced Warhammer 40,000: Eternal Crusade, a multiplayer shooter developed by Behaviour Interactive. The game features four factions (Space Marines, Chaos Space Marines, Eldar, and Orks) and is available via Steam's Early Access now. The final build will release for PC, PS4 and Xbox One later this year. 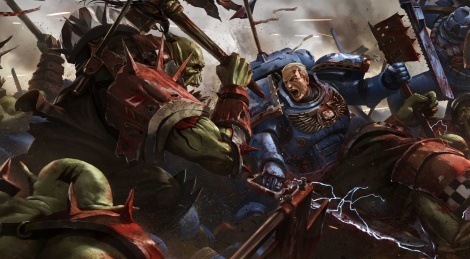 Santa Clara, Calif., (JANUARY 26, 2016) — BANDAI NAMCO Entertainment America Inc. a leading interactive entertainment publisher and developer, today announces Warhammer 40,000: Eternal Crusade, an all-new massively multiplayer third person shooter (MMOTPS) developed by Behaviour Interactive. Warhammer 40,000: Eternal Crusade features a persistent world where players must choose from one of four factions and work together to take down opposing forces. The game will be available later in 2016 on the PlayStation® 4 computer entertainment system, Xbox One system, and Steam for PC. In Warhammer 40,000: Eternal Crusade, four factions -- Space Marines, Chaos Space Marines, Eldar, and Orks -- plan their strategy and deploy their squads as they assault strongholds, defend outposts, and delve into the Underworld to combat hordes of Tyranids. Players must work in harmony both on and off the battlefield in order to advance their faction’s goals and establish supremacy over the enemy. “We are really happy to have BANDAI NAMCO on board as a partner to complement our collaboration with Games Workshop.” – Rémi Racine, Founder and CEO, Behaviour. Rejoice is the coming oblivion!! Looks awful. Shame, since I really liked Space Marine.